Seven years later, Terraria is still one of the best adventures out there. Terraria promises an experience of infinite possibilities. Miraculously, it somehow pulls it off. We originally reviewed Terraria in 2011. Because it has changed significantly since then, we decided to review it again. You can find our original review here. For more on why we've chosen to re-review certain games, head here. What is it? A 2D digging, crafting, and combat game with a massive collection of items. Multiplayer: Co-operative and competitive multiplayer, up to eight on a server. I was deep underground, far from home, looting one of the many abandoned homesteads left to be discovered in Terraria's ever-generous bounty of nooks, crannies, alcoves, and recesses. To my left I found a twisted bit of minecart rail, populated exclusively by a nest of extremely territorial face-eating bugs that seemed eager to prove that my loose assemblage of iron-hewed armaments weren't cutting the mustard anymore. Whatever. This cabin seemed safe. Sure it was covered in musty spiderwebs, and broken furniture, but there was a golden chest on the top floor and a loom I was excited to take back to my modest township on the bottom. What could possibly go wrong? As it turns out, nothing was going to go wrong. There wasn't a scripted boss encounter or an interrupting dirge of story exposition lying in wait for any adventurer who breached the walls. That'd be extremely un-Terraria. However, I managed to find something even scarier. if you're an idiot like me, you might not notice the underground reservoir of water above the roof until you inadvertently jam your pickaxe through the last brick keeping it at bay. The building flooded in seconds, dowsing all of my torches, leaving me in total darkness. I took a few moments to admire the truly unique mess I'd made of everything before pulling out a glowstick (which stay lit underwater), swimming to the foyer, and flinging open the door, which sent the water rushing outwards and away from me. It was a completely improvised solution, in the face of a completely dynamic problem—eclectic dungeoneering, powered solely by the infinite potential of a player's arsenal. That is the essence of Terraria. There's a wonderful splendor to dipping your toes into an uncharted grotto, thousands of miles below sea level. There was a time, back in the already-difficult-to-remember 2011, when Terraria released to Steam and was immediately dogged by comparisons to Minecraft. And it is similar, if 2D. These are two games about digging and building and crafting, supported by a ravenous community willing to pour hundreds of hours into exactly one universe for the rest of their lives. But things have changed since then. Notch sold off Minecraft to buy a house in Calabasas, and today his work is played primarily by nine-year-olds and YouTubers who make videos for nine-year-olds. Terraria, on the other hand, attracts very particular fans, and today it feels like the world at large has determined this little 2D side-scroller is a modern classic. 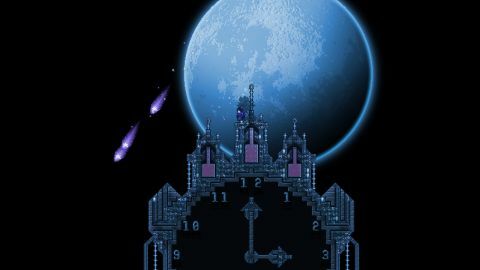 Terraria's core structure remains pretty much the same as it was during its initial unveiling. You create a character, and enter a randomly-generated world (albeit one that's guaranteed to have a few core recurring elements). There's a day/night cycle, which means you'll immediately be under siege by zombies and floating eyeballs as soon as the sun goes down, so your first order of business is to put your starting set of copper harvesting tools to work and construct a house (complete with a table, chair, and light source). Once you have a place to keep you safe at night, the world is pretty much your oyster. You trot across the earth's crust to find some entry points into the vast network of underground caverns below your feet. You'll mine, and chop, and kill enterprising bad guys, and return home with iron, and tin, and buckets of loot sourced from benevolent wooden chests. You'll construct layered workstations to forge your harvest into better weapons and gear, you'll build more houses that will attract new NPCs, who will sell you exotic items or offer fresh haircuts, you'll eventually no longer fear the night, and will cut through zombies like cotton candy. Suddenly, this rudimentary digging game morphed into Gunstar Heroes. But here's the thing: everyone who starts to play Terraria eventually confronts the mind-boggling reality that the digging, and building, and combat they're enjoying are hilariously quaint when compared to the stuff people are experiencing in the mid-to-late game. Yes, you might feel cool once you've crafted your first grappling hook, or dredged up your first pair of double-jump boots from the depths. But inevitably, you'll stumble into a YouTube video of a dude in feathery angel wings with a chain gun soaring across the night sky at a million miles an hour, taking aim at a screen-filling Lovecraftian monstrosity. Suddenly, this rudimentary digging game morphed into Gunstar Heroes. The progression system in Terraria—the way you're able to gear up, or unlock its world-altering bosses—are intentionally opaque. Meaning; you could spend hours without realizing that, like, there are floating islands above your head, or that you can build a lightsaber if you harvest enough bars of meteorite metal, or that you can summon an evil robot Santa Claus with a cursed Christmas present (he drops a unique gun called the "Elf Melter"). That perpetual sense of discovery is what I love most about Terraria. I love knowing that all those tantalizing secrets are buried into the dark corners of the sandbox as soon as I enter—it makes this game feel truly bottomless. Between Breath of the Wild, Monster Hunter, and Dark Souls, the industry at large has acknowledged the magic of letting players stumble into stuff without a waypoint or an itinerary. So, let it be known that Terraria was mining that feeling first, long before the triple-A intelligentsia caught up. I can't find exact numbers, but I believe there was something like a couple hundred items in Terraria at launch. Today, that number is over 3,000, and it seems likely that Re-Logic will continue to support the game for the rest of time. Over the past couple of years the studio has introduced new bosses, new events, 4K support, and an exacting "expert" mode that makes it much more difficult, as well as the usual tweaks, balances, and hotfixes. That being said, I do think we might be at a point where a foundational engine overhaul might be necessary. Terraria still looks pretty, and Re-Logic has stepped in to polish water effects and some other cosmetic stuff, but the sprites themselves remain limited. It's 2018, so maybe it's time to give our characters an actual climbing animation, and maybe it's time to change that awful low-res vocal clip whenever we take damage. The crafting menu is also fairly dated. There's no tech tree to be found in the pause screen, instead your only in-game recourse is to ask the "guide" (the first NPC you meet in Terraria), who will give you a list of items that a specific doodad in your inventory can be used as an ingredient to build. This is a policy that makes Terraria a wiki-heavy game. You will be doing a ton of alt-tabbing if you're looking to outfit yourself with a particular loadout, which can be fun and annoying in equal turns. Perhaps someday Re-Logic will make that information more accessible, but I understand if the company feels like that might contradict some of Terraria's core values. Terraria can truly be whatever you make of it. Overall though, it's impressive how good Terraria feels, all these years later. It shifts between dungeon-crawling, resource-gathering, base-building, and firefights with ease. The combat is simple and satisfying, and there's a real joy to equipping yourself with heavy artillery after spending far too long with a copper broadsword. It also packs one of the most impressive physics engines you'll ever find. Sand and silt billows and accumulates in realistic ways; water and lava slowly fill empty spaces once you've sprung a leak; arrows and shurikens are tugged to the earth by gravity. It lets you solve problems without resorting to videogame logic. I can't think of many other 2D games that let me save my skin by opening the door of a flooded house. Terraria looks a little intimidating from the outside. That's an affliction we all deal with when we examine a legacy product, under a watchful stream of patches and updates, with an international fanbase so deeply ingrained in their own culture that they might as well be speaking a different language. Undoubtedly, you'll do some googling and be confronted with ersatz terms like Hardmode and corruption, and Insane Cultists, and crystal hearts. It is those overwhelming moments where we all want to regress back into our happy place—the games where we've already put in the work to know what we're doing. What I will say is that Terraria can truly be whatever you make of it. You can download a checklist that will fast-track you through all the optimal crafting paths or boss strategies. Or you can simply get lost in the transcendental meditation of digging, and finding cool stuff, and doing more digging. Kill the brain of C'Thulu with a revolver, or find a nice bookcase and proudly mount it on the second floor of your apartment. Whatever it is, Terraria will find you.